Yay! Another easy (and reasonably healthy) meal! My family adores enchiladas and cannot get enough of them. This recipe is definitely not the fanciest recipe ever, but it has a lot going for it: 1) it's quick! 2) it's easy! 3) it's delicious! 4) it's made using ingredients I always have on hand. I hadn't made these enchiladas for several months, and when I made them for dinner last week, Geoff said he had forgotten how delicious they were. I quite agreed! Someday I'm going to have to make a round up of all my favorite ways to use rotisserie chicken, because I use it all the time! 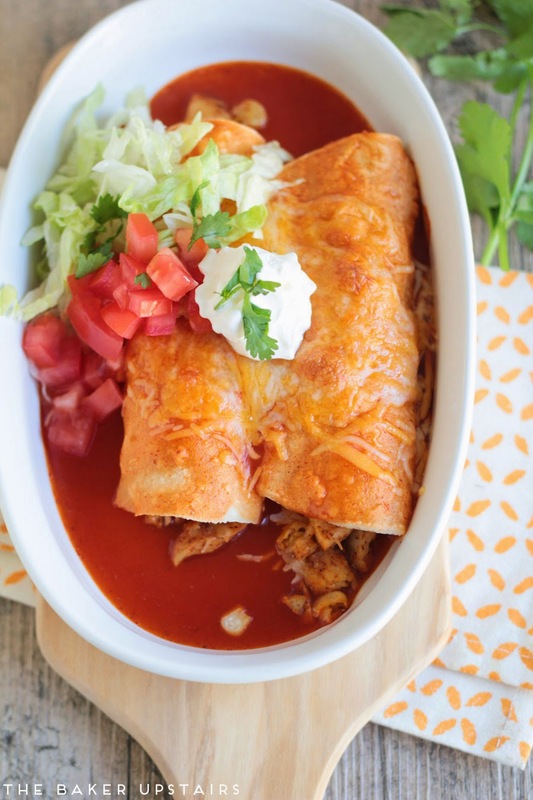 These enchiladas are so quick and easy when you use pre-cooked shredded chicken. It obviously doesn't have to be rotisserie chicken - this recipe or this recipe would work just as well. 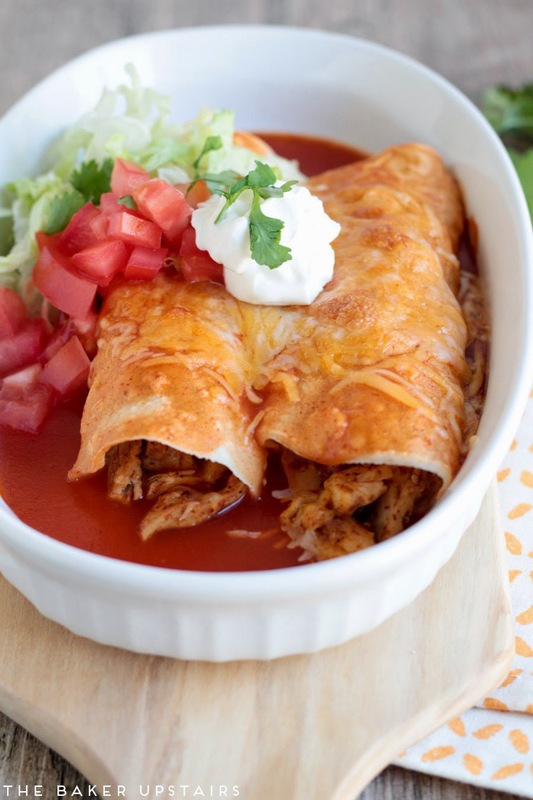 You could definitely substitute flour tortillas, but to me, true enchiladas are always made with corn tortillas. (I say that while fully recognizing that these are nowhere near authentic.) You can use either red or green enchilada sauce with equally good results. These are the perfect dinner for a lazy night. Or a busy night. Or a night when you just want something delicious that doesn't take all night to make. Yum! toppings of your choice: shredded lettuce, diced tomatoes, salsa, sour cream, avocado, cilantro, etc. Preheat the oven to 350. In a medium skillet, combine the chicken, corn, cumin, chili powder, and salt and pepper, and cook until heated through. Spread a few tablespoons of the enchilada sauce in the bottom of a 9 x 9 baking dish. 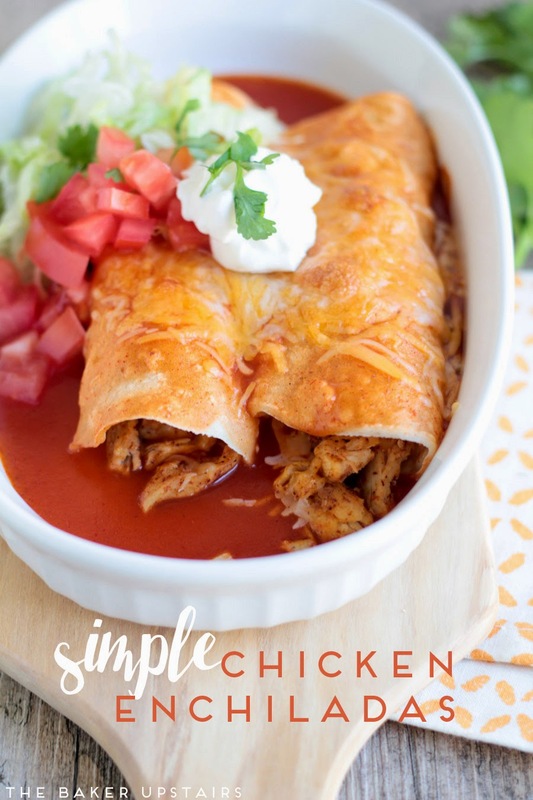 Assemble the enchiladas by adding about 1/4 cup of the chicken mixture to the center of the tortilla, sprinkling with a little cheese, and rolling up. Place seam-side down in the prepared baking dish. Pour the remaining enchilada sauce over the top of the enchiladas, spreading to cover the tops of the tortillas. Sprinkle with remaining cheese. Bake 15-20 minutes or until the cheese is melted and bubbly. Serve hot with toppings of your choice.